Now that the day has come and gone, I can post about the gift I made for my Nana’s birthday. The handkerchief is made from a white piece of fabric. I’m really not sure what the fiber content is. 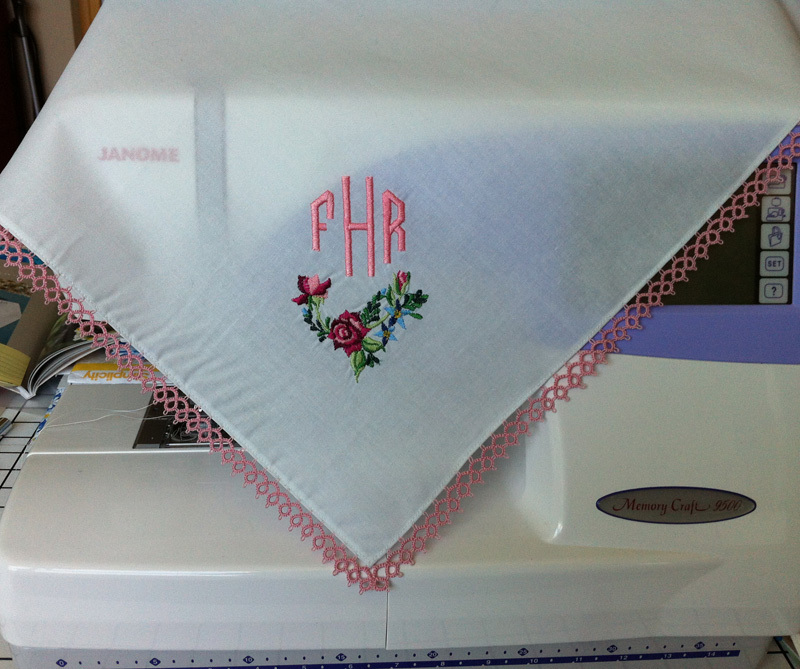 I embroidered her monogram on the corner with a spray of roses on my machine. Then I tatted a pink edging to go all the way around the border. If I tat an edging like this again, I will probably attach it as I go. On this one, I made the yardage and then attached it to the fabric. It was quite easy to do, but took some real planning and adjustment to make the corners end up where they would line up with the fabric corners. Here is the result. So pretty. Bet she loves it! What a gorgeous work of art. Most definitely would not want to blow my nose on it though! Going to have to look up tatting now!